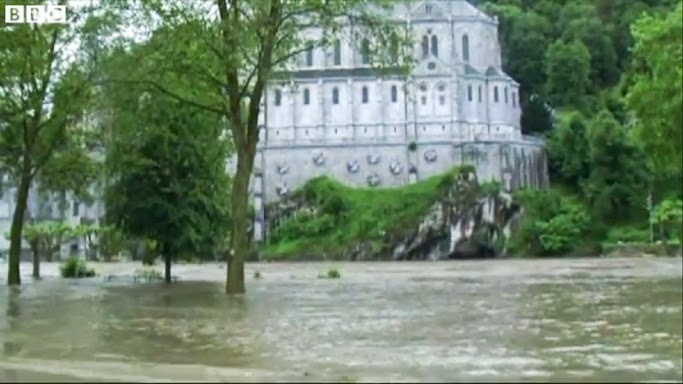 Shrewsbury Diocese tweets under the Twitter handle @ShrewsRCnews and Simon Caldwell has been busy tweeting about the flooding in Lourdes because it will affect the diocesan pilgrimage to Lourdes planned for the end of July. 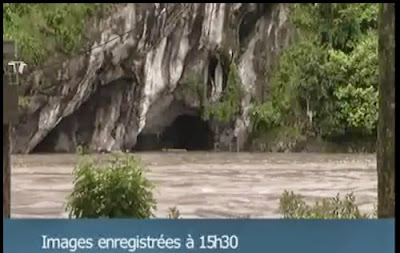 It looks as though the Grotto itself will be opened up from Monday (possibly sooner) but the Domaine has suffered serious damage which will cost millions to repair. 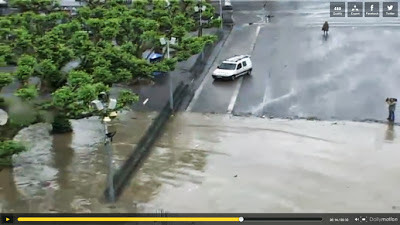 Several hotels have been forced to close because of flood damage, and are unlikely to reopen this season. The Underground Basilica of St. Pius X was flooded out (I saw it on one of the video clips) and it's hard to believe that it will be opened any time soon. The Church of St. Bernadette (opposite the Grotto) will have to remain closed all season because of serious structural damage. Despite the difficulties this will cause, the diocesan pilgrimage will still go ahead. In addition, they plan to donate €5000 towards repairs (along with any other donations people care to contribute.) Apparently they did the same thing after the floods last October. If anyone else wants to contribute, details can be found on the Diocese of Shrewsbury News Updates page. Disability groups have fought hard for years against discrimination, and rightly so. 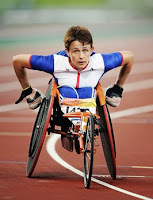 The 2012 paralympics was lauded as a tremendous sign of triumph over adversity, an indication of what people with all sorts of disabilities can achieve - and, quite frankly, all of the so-called "disabled" sportsmen and women could wipe the floor with me in any of the sporting events. But there is one teensy little point which very few people appear to have mentioned. Society at large (and British legislation in particular) actively encourages direct discrimination against disabled people in one case: any person with a disability can be aborted up to birth. According to Section 1 of the Abortion Act 1967, the legal limit for an abortion in the UK is 24 weeks. After 24 weeks, presumably, the medics and legal bods have decided that the baby "becomes" a real person, because Sections 58 and 59 of the Offences Against the Person Act 1861 come into play. However, if the baby has a substantial risk of being born with a disability, then the 24-week limit doesn't apply. 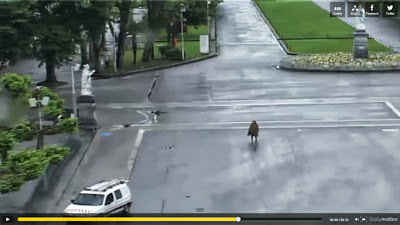 Note that the disability doesn't have to be definite, there just has to be a substantial risk. No-one has, to my knowledge, actually gone as far as defining what constitutes "substantial." I doubt that any hospital, clinic or doctor would be too keen on insisting that the risk was only a small one and so refusing to give an abortion, just in case the baby did have a disability and the parents subsequently sued. It might put a sizable dent in the Health Trust's budget! I have read of more than one case where an abortion was carried out, and the disability turned out to be a cleft palate. And did I mention that the disability doesn't have to be a physical one? Mental abnormalities are also included. What those abnormalities have to be before the baby qualifies as an exception to the Offences Against the Person Act are similarly undefined. When the Abortion Act was brought in, it was thought that there were sufficient safeguards to keep abortion from being used too freely. Unfortunately, fallen human nature being what it is, we can't see a boundary without pushing it as far as it will go... and then pushing a bit more. So it's ok to discriminate against disabled people up until they are born... and then it is no longer acceptable. The Royal Dutch Medical Association (KNMG), representing doctors in the Netherlands, has said that distress felt by parents can justify "euthanasia" of a dying newborn, making it acceptable, or even necessary. Already, the 2004 Groningen Protocol sets out medical guidelines on "euthanasia" for minors, and this has allowed medical practitioners to end the lives of many children with spina bifida. Dame Tanni Grey-Thompson, for example, would never have been given the chance to win her 16 Paralympic medals, nor would many others be allowed to show what they could achieve, being "weeded out" early on so as not to cause their parents distress. So it would seem that we have come full-circle, and discrimination against people with disability is not just considered acceptable, but actually necessary. Oh, and did I mention that the Dutch also want to be able to decide to "euthanise" adults with Alzheimer's or other dementias if they have been judged to be "incompetent"? Twitch of the mantilla to Deacon Nick Donnelly for highlighting this. I happened to be shopping in Dartford on Monday afternoon. 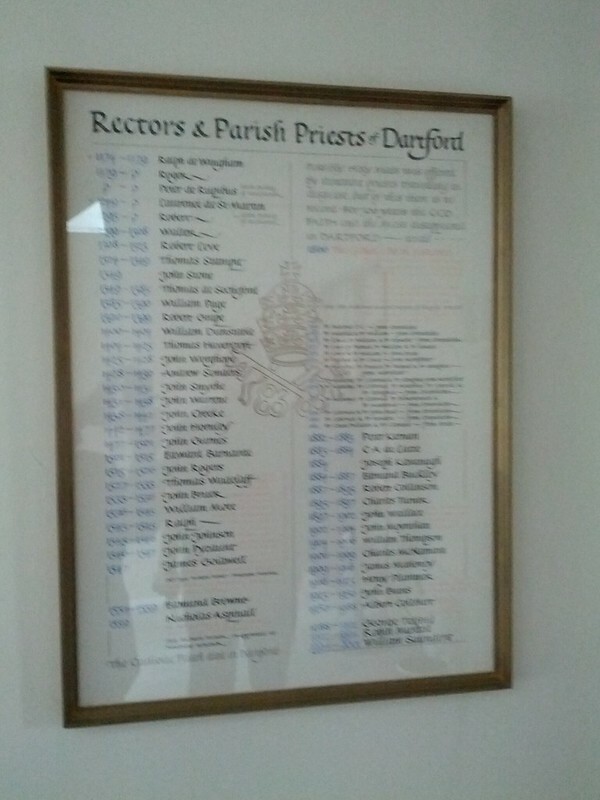 Despite Dartford being only 5 miles away, to my shame I hadn't managed to get to see Fr. Stephen Boyle since his appointment as Parish Priest to St. Anselm's last September, so I stopped off for a coffee and a chat. Fr. Stephen doesn't have a blog, but he does like appearing on them. The parish website, however, is run on a Wordpress template - technically that is a blog, but I suspect that someone else maintains it! Unfortunately the lighting meant I couldn't get a clearly focused photo on my phone (I will try again the next time I'm there), but the names go all the way back to the 12th century (with a gap for the Reformation period when it states that there may have been priests living clandestinely in the area). Sadly there hasn't been room for the last two parish priests... maybe Fr. Stephen will start up a new inscription. I also had the chance to admire the new lighting which has just been installed in the church. Fr. 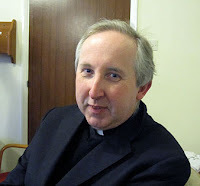 Stephen told me that the Day With Mary team will be visiting his parish on Saturday 29th June. To my great disappointment, I missed the one in Blackfen back in March, so I want to try to get to part of this one. For those of you who can't make it to any of these days, the Day With Mary team now put the talks online on their website - if you click on a video near the bottom you need to scroll back up to watch it as it won't open as a pop-up (I was clicking on several videos for ages before I twigged... a real blonde moment!) However, these short talks don't convey the atmosphere and impact of the days themselves (though a previous post of mine might give you a glimpse), so, if you hear of one happening near you, I really do recommend that you go along! The flooding is much worse than last year - and it is happening at the height of the pilgrimage season, which will affect many of the townspeople who rely on the pilgrims for their livelihoods. The water level of the Gave de Pau does seem to be going down, but it depends on whether or not there are further storms. Mark Lambert has a more detailed report of the damage identified so far. Please pray for everyone concerned. 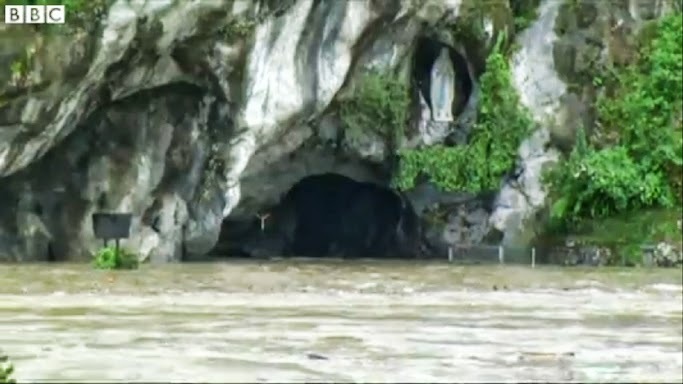 I was heartbroken to hear that, once again, the Grotto at Lourdes is under about 3 feet of water. Fr. George Byers posted the photo on his blog. Lourdes is one of my favourite places. The webcams at the Grotto appear to be down, so no idea when things will improve. 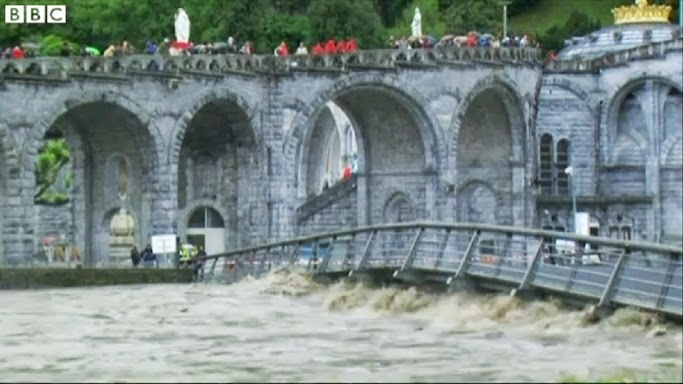 Pray that all pilgrims, and all the local inhabitants of Lourdes may be kept safe. 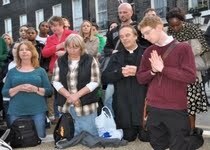 The BPAS abortion centre in Bedford Square is due to close. The site will still run contraceptive services such as vasectomy, but the abortions will no longer happen there. I have no doubt that the prayers, vigils and fasts held by many people over the years, as described by Clare in her latest post, have resulted in this victory. The abortion industry wouldn't close a clinic unless it was losing money, and so there must have been more and more women changing their minds about killing their unborn babies, some directly as a result of contact with the pavement counsellors, and some because of a change of heart inspired by the Holy Spirit after heartfelt prayers from faithful souls. 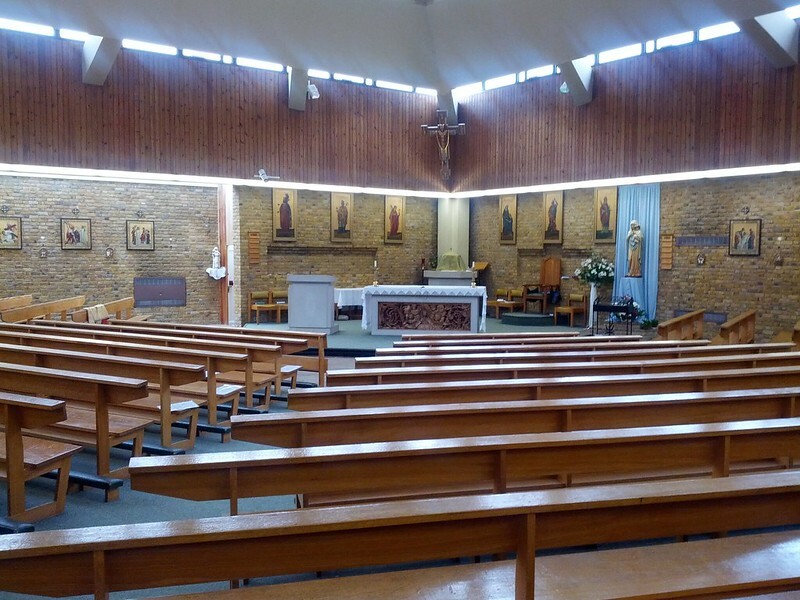 After this morning's TLM in Blackfen, I asked Fr. Logan (covering for His Hermeneuticalness while he is in Oz) if he minded me taking photos of him and uploading them to the blog. "What, to go with the cats?" was the swift rejoinder. I was delighted to discover that Fr. Logan reads my blog, and follows the adventures of Cardinal Furretti and Monsignor Miaowrini avidly. Later, he asked me if I knew who Eccles was?